Executives are out of sync with what investor interest in environmental, social, and governance (ESG) metrics. There are dozens of ESG criteria, including greenhouse gas emissions, energy efficiency, data protection, and corruption. Investors are increasingly attracted to sustainability because it contributes to financial performance. Despite the unprecedented growth of sustainability focused investing and reams of evidence making the business case, executives still don't get it. Many executives under value investor interest in the ROI of ESG. These execs are leaving money on the table as sustainability-oriented investment funds are now worth trillions of dollars. According to a May 2016 report titled "Investing for a Sustainable Future" investors are increasingly interested in using sustainability-related data as a rationale for investment. 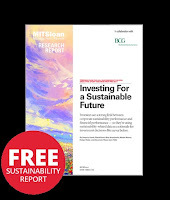 The research and analysis for this report was conducted under the direction of the authors as part of an MIT Sloan Management Review research initiative in collaboration with and sponsored by The Boston Consulting Group. The report polled more than 3,000 respondents from commercial enterprises in more than 100 countries. The report suggests that there is a communications gap between what a company's investor relations department is saying and what investors want to know about sustainability. The offshoot is that sustainability performance may not be highlighted in their communications efforts. This also has both strategic an operational implications that may disadvantage a firm. By failing to appreciate the interest in ESG a company may make tactical and long term planning decisions that are at odds with what investors want. While 75 percent of senior executives in investment firms say performance related to sustainability is materially important when making investment decisions. However only 60 percent of managers in public companies share that view. Three quarters of investors say that improved revenue performance and operational efficiency from sustainability are strong reasons to invest. Almost half of investors say they will not invest in a company with a poor sustainability record and almost two thirds (more than 60 percent) of investment firm board members say would divest from companies with a poor sustainability footprint. There is also a disconnect between what companies think about sustainability and what they are actually doing. While 90 percent think a sustainability strategy is important only 60 percent of such companies have a strategy and only a quarter of companies have developed a clear business case related to sustainability. Build awareness of sustainability challenges and programs with internal and external stakeholders. Once tangible measures are established, formulate a strategy. Incorporate the sustainability strategy into the overall corporate strategy, including a clear business case or proof of value. Engage a broad range of stakeholders to discuss sustainability strategy and progress. To access the free report click here.